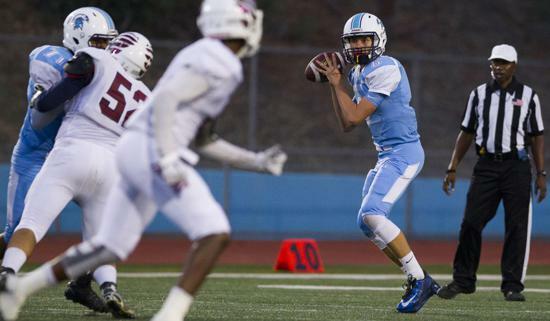 University City quarterback Kees Van Daelen looks downfield for an open receiver in Friday’s game against Scripps Ranch, which dealt the Centurions their first loss of the season. Two Septembers ago, Kees Van Daelen was a 5-foot-10, 140-pound sophomore defensive end on University City High’s JV football team. Today, he’s a 6-foot, 170-pound senior starting quarterback on a team making plans to play deep into the Division IV playoffs. Plus, he’s one of the San Diego Section’s leading passers. How’d Van Daelen go from skinny sack man to Big Man On Campus? It helped that the kid expected to be the Centurions’ starting JV quarterback last year broke his arm skateboarding. Van Daelen played quarterback on flag football rec teams in junior high. So when he heard there were going to be QB tryouts, he showed up. “We were shocked he could throw the ball the way he could,” said UC head coach Ryan Price. Fifteen wanna-be QBs tried out. Van Daelen won the job. He was the Centurions’ starting JV quarterback last year and pulled double-header duty on Fridays, suiting up for varsity evening games after his late-afternoon JV outings in case third-year starter Drake Augon suffered an injury. Sure enough, Augon suffered a concussion against Bishop’s. Van Daelen stepped off the bench and led the Centurions on a game-winning touchdown drive. “It felt great to finally show what I could do with a lot of people watching,” said Van Daelen. With Augon graduated, Van Daelen is now the unquestioned man behind center for UC (2-1), which stumbled Friday night in a 35-19 setback to Scripps Ranch. Van Daelen was 20 of 29 passing for 294 yards and two touchdowns, but he was outplayed by Scripps Ranch QB Kyle Mullin, who finished 24 of 42 for 436 yards and four TDs. Van Daelen came into the game with 602 yards passing, tied for second in the section. Making Van Daelen’s Accidental Quarterback story more fascinating is the way he plays the position, which might be described as unorthodox. His throwing motion will not be digitally burned and archived for a how-to passing video. “He has the most awkward throwing motion,” said Price. Rather than a classic, high-above-the-ear delivery, Van Daelen throws three-quarters and seems to push the ball more than throw it. When Van Daelen takes off running, which is more than occasionally, his style does not give the impression he’ll one day replace Olympic decathlon gold medalist Ashton Eaton as the world’s greatest athlete. “He’s not the most athletic guy,” said teammate Casey Granfors, an incredibly gifted 6-foot-3 sophomore wide receiver. In essence, Van Daelen is the human mirage. You see one thing and get another. Even his first name, Kees, is deceptive. Owing to his Dutch heritage, it’s pronounced Case. He was wrong. The skinny defensive end morphed into a quarterback.